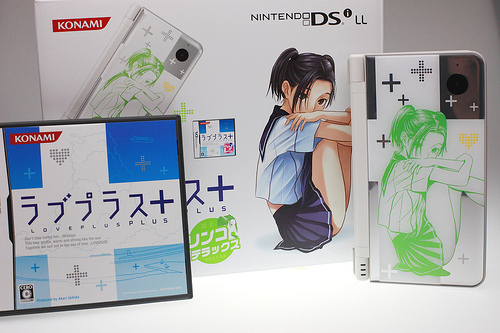 Love Plus is a dating simulation game for Nintendo DS. Since its release in September 2009, it became immediately popular and sold 50,000 in the first week, which is a quite large sale for a dating simulation game. Many users take their virtual girlfriends to wherever they go and communicate with them through text and phone call in the game. It even causes problem to real relationships as the users girlfriends and wives get upset because their men are so into digital girlfriend. Last week, Love Plus Visa Card was released by Mitsui Sumitomo Card. On the card, the girls in the game are printed.